FIREBALL RUN comes to Pulaski County, MO October 2nd & 3rd! What: Cheer on Pulaski Pride as they cross their hometown finish line! Mingle with exciting celebrities and see exotic cars! Meet exciting celebrities and see exotic cars at the FIREBALL RUN Finish Line! What: Root on Pulaski pride as they and the other “Fireballers” take off for Sedalia, MO. 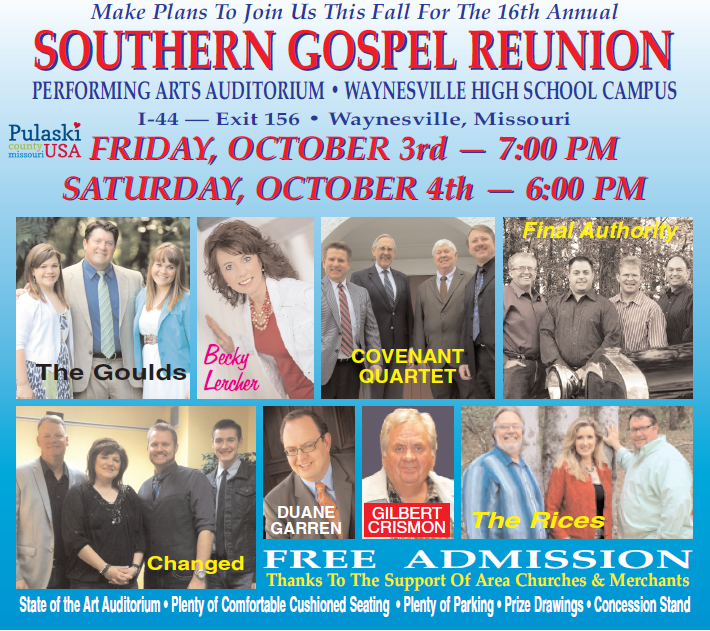 FREE Southern Gospel Concert in Waynesville, MO October 3rd & 4th! 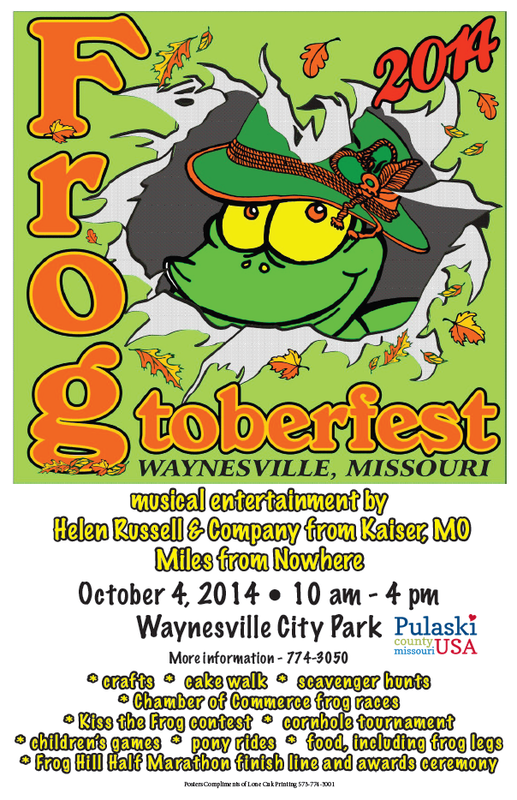 What: Marathon that winds down Route 66 and ends at Frogtoberfest. 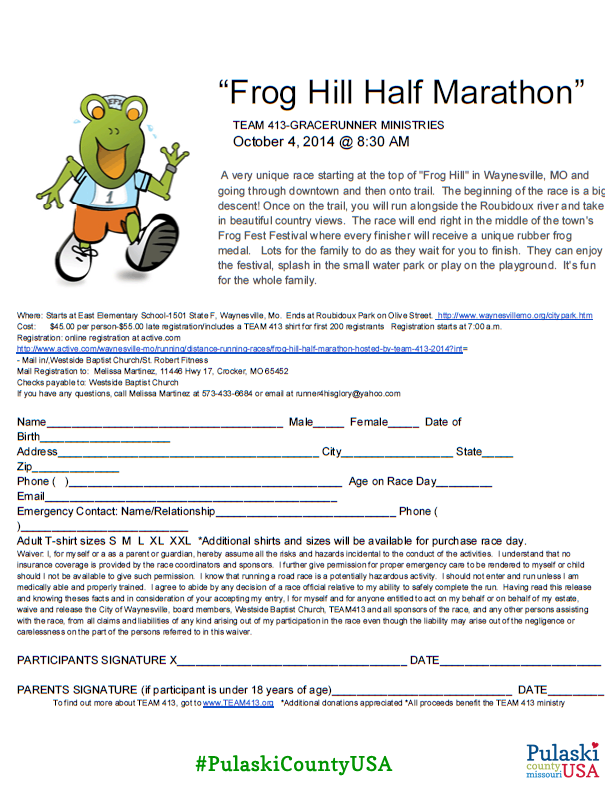 Frog Hill Half Marathon on Route 66 in Waynesville, October 4th. What: Family friendly festival celebrating Waynesville’s mascot, W.H. Croaker (Frog Rock). You are invited to Frog Rock’s Birthday Party October 4th in Waynesville. 13 Reasons To Be At The Fireball Run Finish Line Festivities! FIREBALL RUN: America’s Frontier thunders into Pulaski County, MO October 2nd! 40 teams will compete in “secret missions” in Crocker, Dixon, Richland, and Saint Robert, before crossing the Day 6 Finish Line in downtown Waynesville. The finish line festivities are open to the public between 3:00 and 6:00 p.m. and you are invited to attend! Here are our top reasons of why you should bring your family to the Square for FIREBALL RUN! 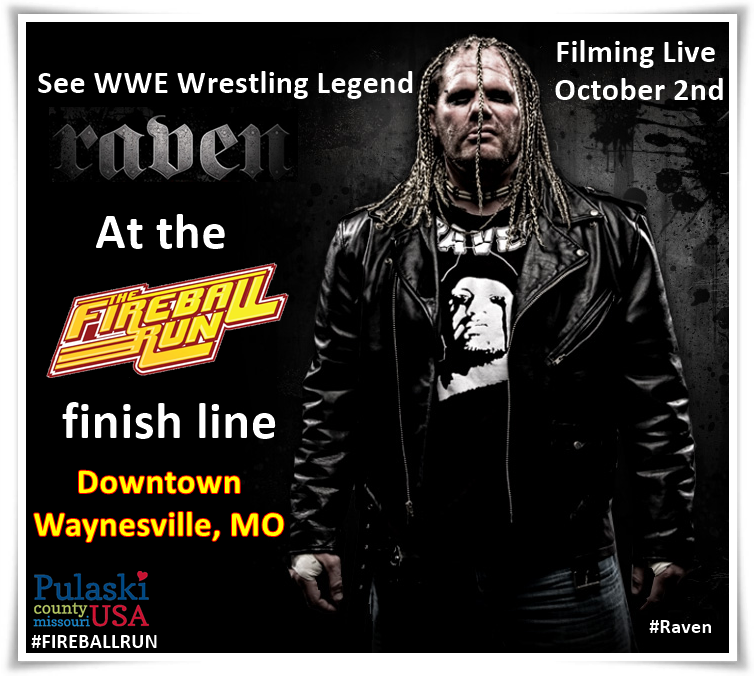 Raven: FIREBALL RUN’s series host this year is WWE wrestling legend Raven. #RallyFighter- This is the same car that was featured in Transformers: Age of Extinction. You will recognize it as one of the “scary cars”. #Munchie- Munchie has a laid back kind of style and is a healthy eater. He is particularly fond of granola. 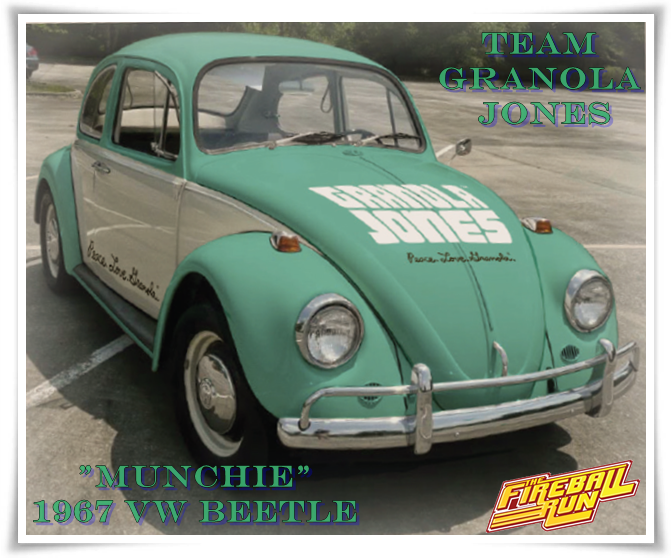 Granola Jones’ “Munchie” will be at the FIREBALL RUN Finish Line Festivities October 2nd (3-6 p.m.) in downtown Waynesville. #TeamEnid- Dr. V & Aaron Brownlee are surrounded with class, sophistication, power, speed, and style in this 2009 Aston Martin DBS. 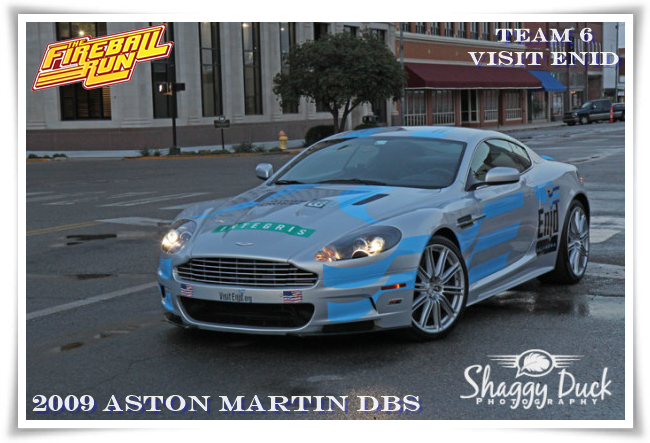 This sweet ride, an Aston Martin DBS featured in Casino Royale, will be at the FIREBALL RUN Finish Line Festivities in downtown Waynesville October 2nd. 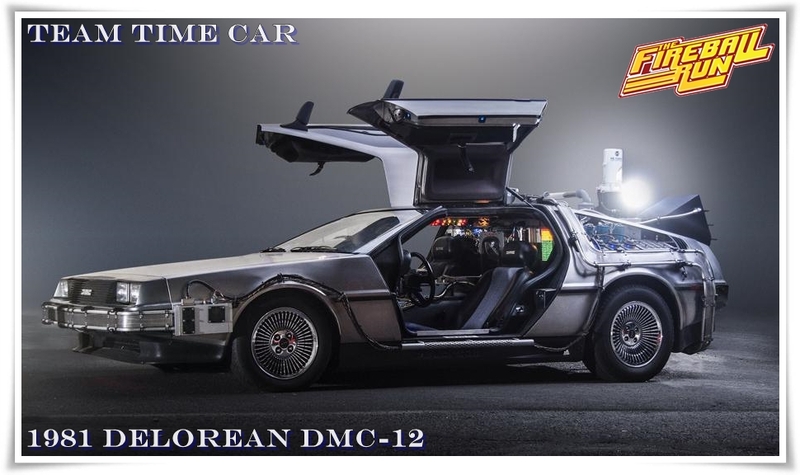 #TeamTimeCar- is a 1981 DeLorean DMC-12 inspired by the 1985 Hollywood blockbuster “Back To The Future”. This is Doc Nigh’s sixth season in Fireball Run and his collectible trading card is a fan favorite! Team Time Car is a 1981 DeLorean DMC-12 inspired by “Back To The Future”. 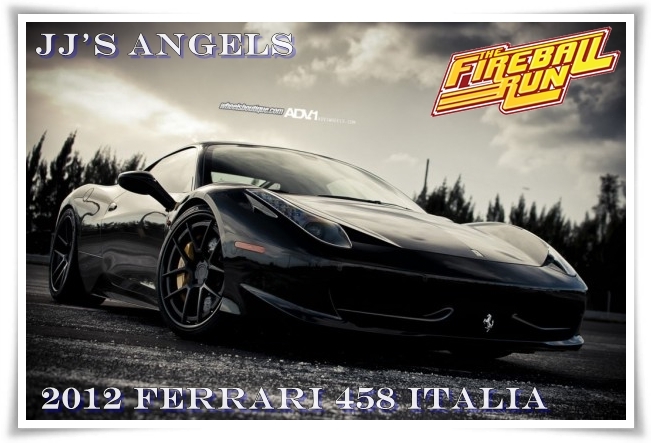 J.J.’s Angels- are running a 2012 Ferrari 458 Italia. It is going to look great in Downtown Waynesville! 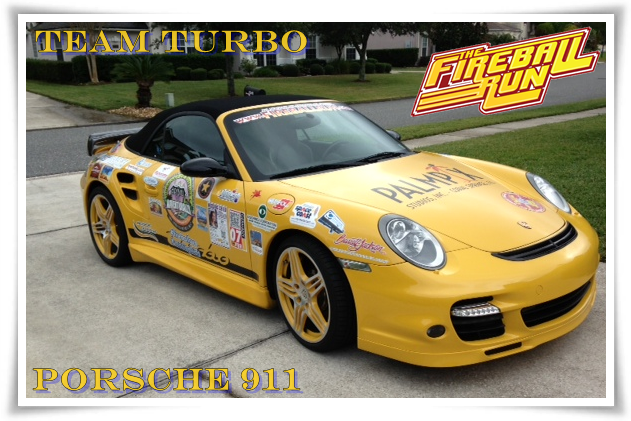 #TeamTurbo is bringing a Porsche 911 Turbo to their first FIREBALL RUN! 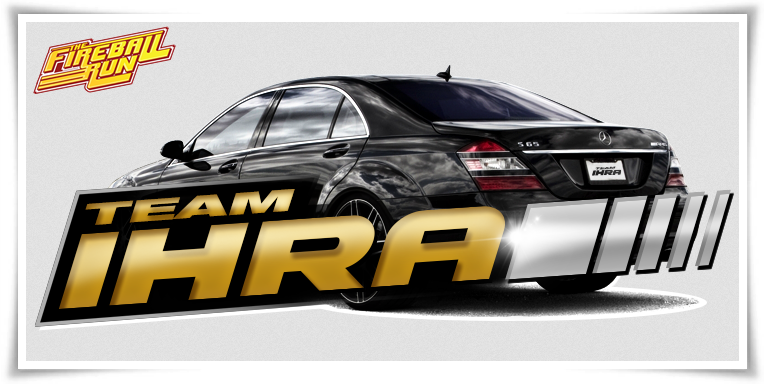 #TeamIHRA- The International Hot Rod Association is racing a sweet 2007 Mercedes-Benz S65 AMG. 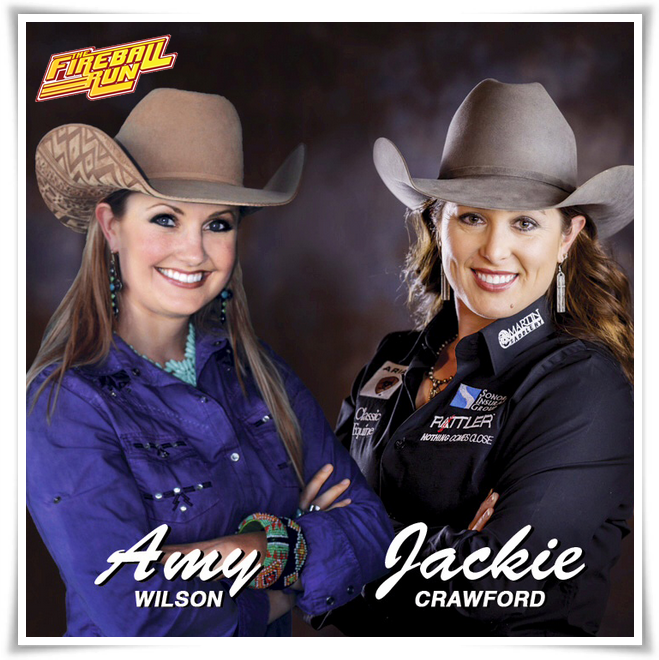 #TheCowgirls- respresent the Women’s Professional Rodeo Association and the team consists of 2008 Miss Rodeo America and RFD-TV television host Amy Wilson and 10-time WPRA world champion roper Jackie Crawford. Kelly Kaminski- is a two times World Champion Rodeo Cowgirl. The Jet Jockeys- Marisha and Elaine live their lives at full throttle. They are most at home in the cockpit of their 5000 HP jet dragsters. They will “fireballing” in a 2014 Corvette Stingray. 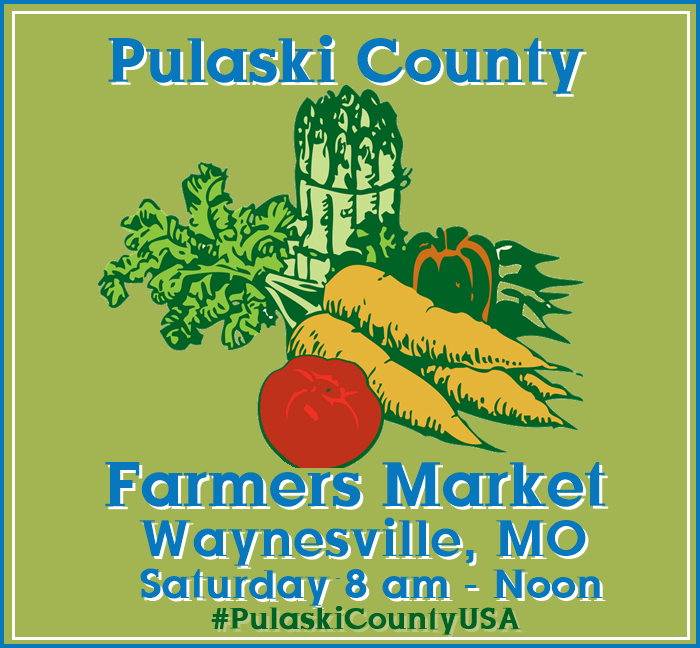 #Team10- Be at the Waynesville Finish Line Festivities to cheer on our hometown heroes, Pulaski Pride! 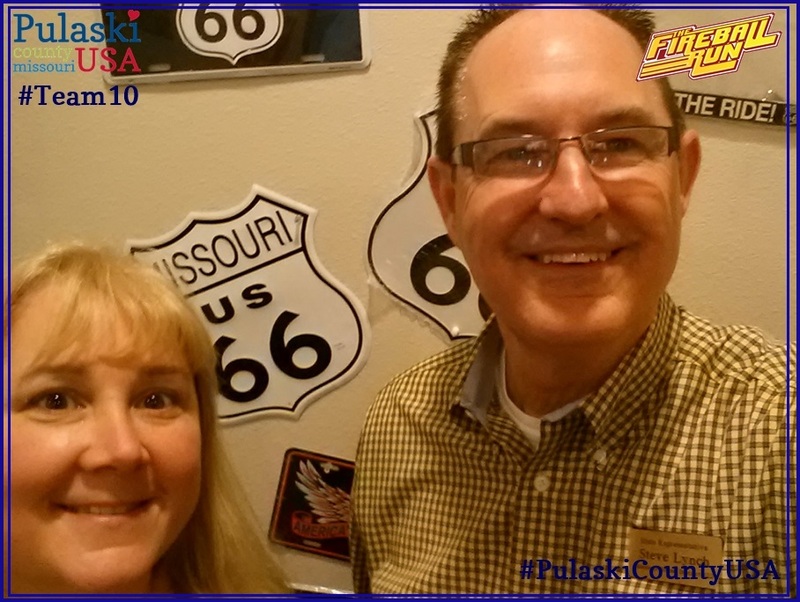 Steven Lynch & Cecilia Murray have been representing Pulaski County from Frisco, Texas and are looking forward to seeing familiar faces in this crowd before they resume the race to Independence, Missouri. They are driving a 2008 Dodge Caravan that doubles as a rolling billboard for Pulaski County Tourism Bureau. Child Rescue Network- In addition to being America’s most epic adventurally, FIREBALL RUN is also racing to Recover America’s Children. All of the teams have been assigned a missing child from their region and are distributing posters on their route. Kylie Lawrence has been missing from Springfield, Missouri since July 28, 2013. 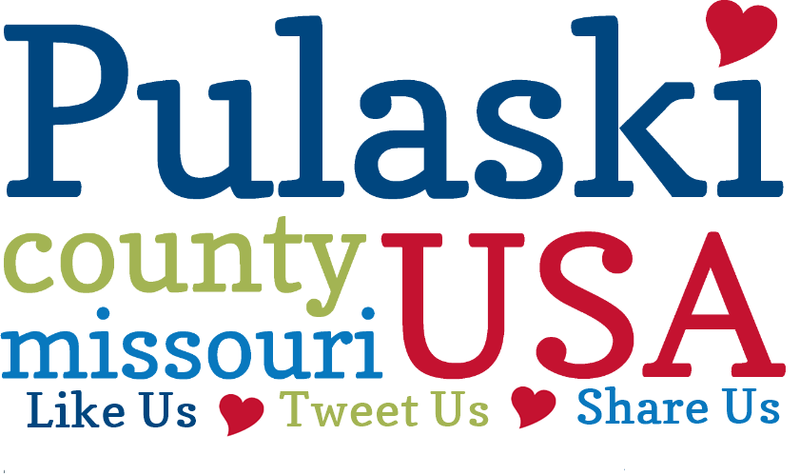 Pulaski County Tourism Bureau would like to thank Team 10- Pulaski Pride’s Sponsors: Century Link, Security Bank, USA Tours, and 2013 Missouri Chamber of the Year: Waynesville-St. Robert Chamber of Commerce. You will notice their decals on the team vehicle. FIREBALL RUN Team 10- Pulaski Pride sponsors. In addition to sponsor decals on Team 10’s FIREBALL RUN vehicle, you will also notice a bat sticker. This sticker is to celebrate, publicize, and promote the National Speleological Society Convention that will take place in Pulaski County, Missouri July 13-17, 2015. Ask Team 10 about their bat sticker! 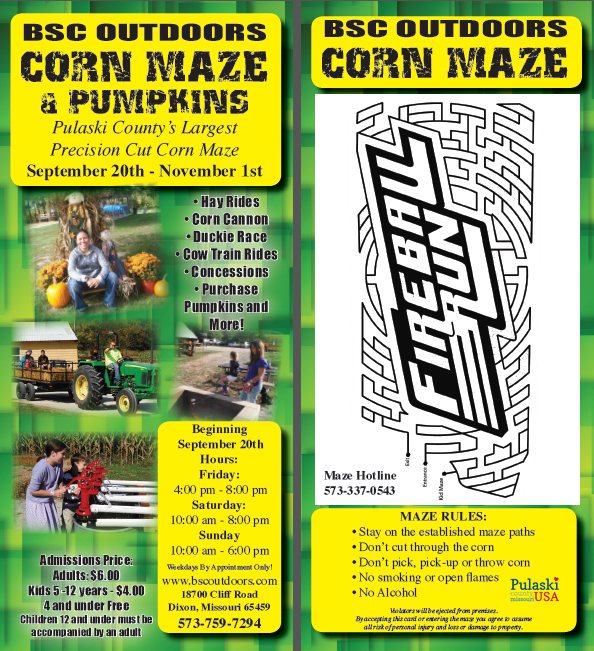 The Fireball Run logo is the design of Boiling Spring Campground’s corn maze for the 2014 season. The “Scary Car” Rally Fighter from Transformers and WWE legend Raven will be appearing at the Finish Line in Waynesville! 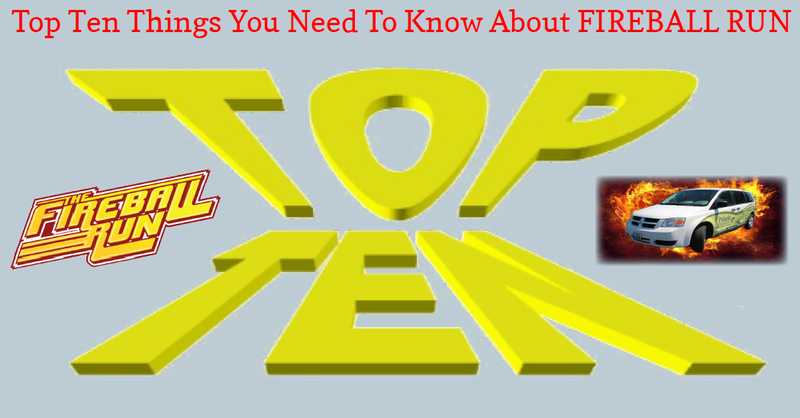 Top Ten Things You Need To Know About FIREBALL RUN! 1. The FIREBALL RUN is not the Cannonball Run. Teams are not allowed to speed and it is not a cross country car race. 2. This is Season 8, America’s Frontier. There are 8 featured destinations in 8 days. 3. 40 driving teams solve clues and accomplish tasks based on each destination’s points of interest, history and culture. The team with the most points at the end of the 8 day, 2,000 mile event wins. 4. This is a county wide event; all 40 teams will end up at the day’s start/finish line, October 2 in Waynesville. You can meet the celebrities and teams, get autographs and take pictures of their vehicles. 5. Pulaski County is not only a destination but will have Team #10 Pulaski Pride entered in the event. State Representative District 122 Steven Lynch and Waynesville – St. Robert Chamber of Commerce Cecilia Murray will participate in the 8 day event. 6. Cars that will participate in FIREBALL RUN include, the Delorean Time Car from “Back To The Future,” the Rally Fighter “Scary Car” from “Transformers: Age of Extinction,” and representation from Ferrari, Rolls Royce, Lamborghini, Jaguar and more. This will be a huge picture taking opportunity and a fun event for car enthusiasts. WWE legend Raven is the host. 7. Unlike Reality TV, this event is real and nothing is staged. The entire event will be streamed live to a world audience at FireballRun.com and filmed as part of a popular online TV series to be released in 2015. 8. The event is an economic development opportunity for Pulaski County. Destinations are selected based upon their uniqueness, history, vitality, vibrancy, economic opportunity and human interest. 9. The FIREBALL RUN is also tied into a massive effort to recover America’s missing children. Since its inception in 2007, FIREBALL RUN has aided in the recovery of 42 missing children. 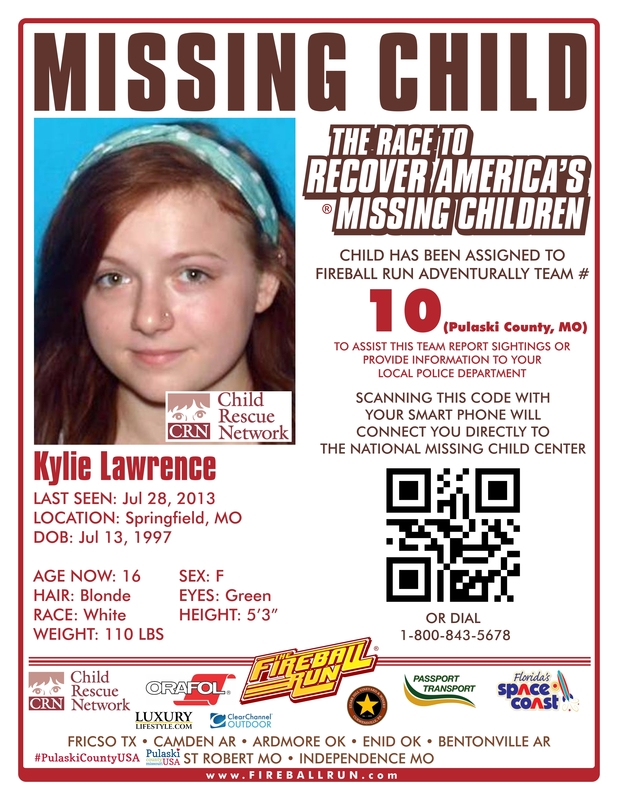 Team Pulaski Pride will be distributing flyers of a regional area missing child, Kylie Lawrence. 10. The Finish Line LIVE Event is October 2nd in Downtown Waynesville from 3 p.m.- 6 p.m. and LIVE Green Flag Start is October 3rd in Downtown Waynesville from 8:30-9:30 a.m. NOTE: The Downtown Square area will be closed ALL DAY on October 2nd to thru traffic- businesses will be open; traffic will be re-routed. Historic Route 66 in the Square area will be closed October 2nd, 3-6 pm. On October 3rd, Historic Route 66 will be closed 8-10 am. NOTE: Online voting for FIREBALL RUN Peoples Choice Award has began. 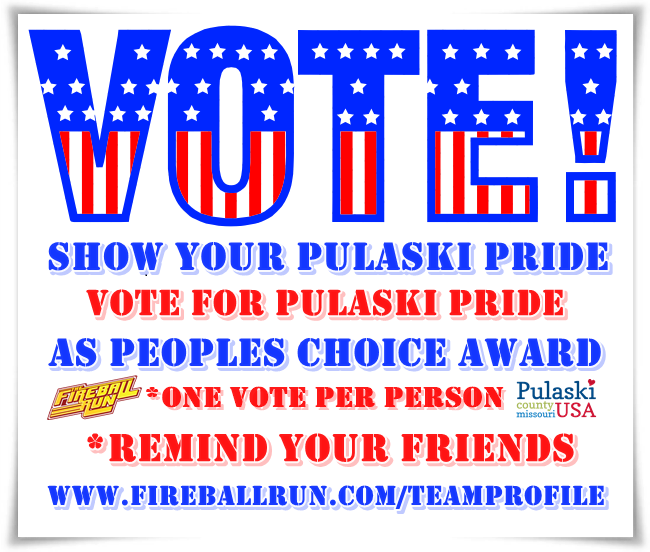 Please visit http://www.fireballrun.com/teamprofile and vote for Team 10- Pulaski Pride. You can vote once, but can remind your friends to vote as often as you wish! 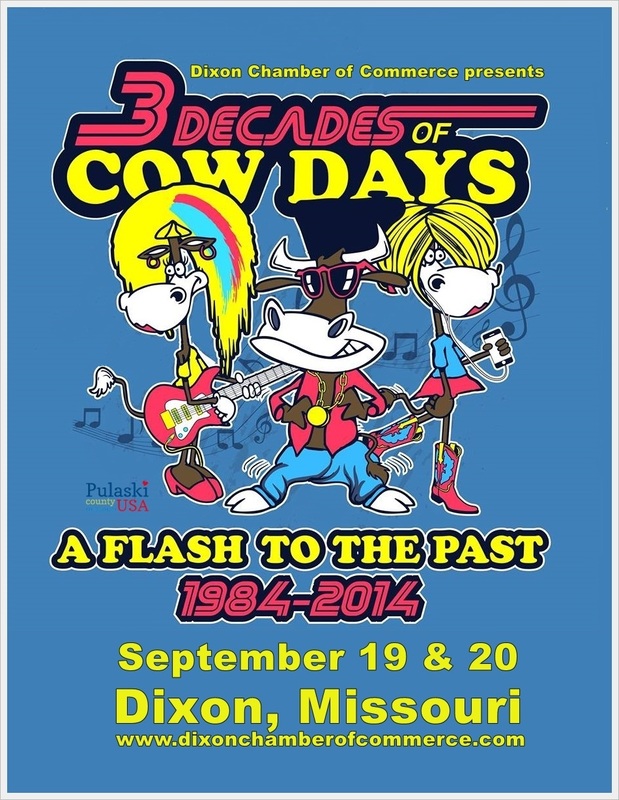 Win a cow at Cow Days in Dixon, MO. September 19th & 20th! 4 Things That You Will Love During Autumn In Pulaski County USA! “Autumn”- almost a magical word, it brings a promise of beautiful colors, hearty comfort food, pumpkin; apple; caramel; and cinnamon flavors, hoodies, leaf piles, bonfires, the harvest, and time with family. It might also make you think of jack o’ lanterns and things that go bump in the night. All the glorious things that are pictured in your mind when you hear the word are right here, waiting for you and your family, in Pulaski County, Missouri. Pumpkin patches, the farmers market, Oktoberfest food & celebrations, harvest festivals and these 4 things below that you absolutely can not miss, Pulaski County USA is the heart of Fall! 1. Boiling Spring Campground Precision Cut Corn Maze- This is not your average corn maze! Rob Stouffer of Precision Mazes whittled away 300-400 bushels of corn out of the 10+ acres that were planted to create this corn maze gem! He incorporated the FIREBALL RUN logo into the maze and after 8 hours of cutting he had carved out over 17,000 feet of pathways for families to get lost in together as they make their way through the jumble of corn stalks. One of a handful of Precision Mazes in Missouri, Boiling Spring Campground’s maze is sure to be a highlight of your family’s Autumn! 2. 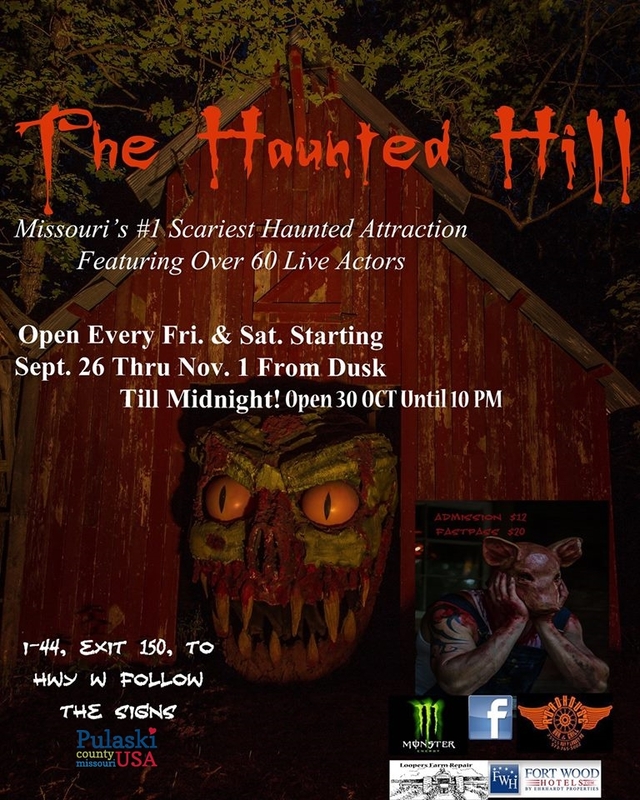 Haunted Hill- Missouri’s most frightening haunted experience, Haunted Hill has been described as the highlight of October and so creepy that the “place made my skin crawl during the day”. More than a haunted house, Haunted Hill is a trail that winds through an Ozark Mountain forest and leads you through several buildings, each one with its own ghoulish delights! At the end of the trail you feel a sense of accomplishment, survival, and relief, but the adrenaline, and the Hill itself will stick with you for a time. 3. 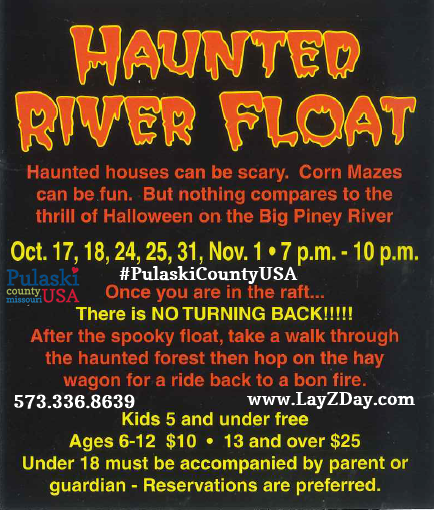 Haunted River Float- Nothing compares to the thrill of Halloween season on the Big Piney River! Grab your pals and jump into your raft as you float in the darkness and experience the river like never before! The spookiness looms ahead and the unknown is unnerving! And then….you hear the banjo! More haunted experiences await you once you get off the river before your hayride back to the warm bonfire at the campground. 4. 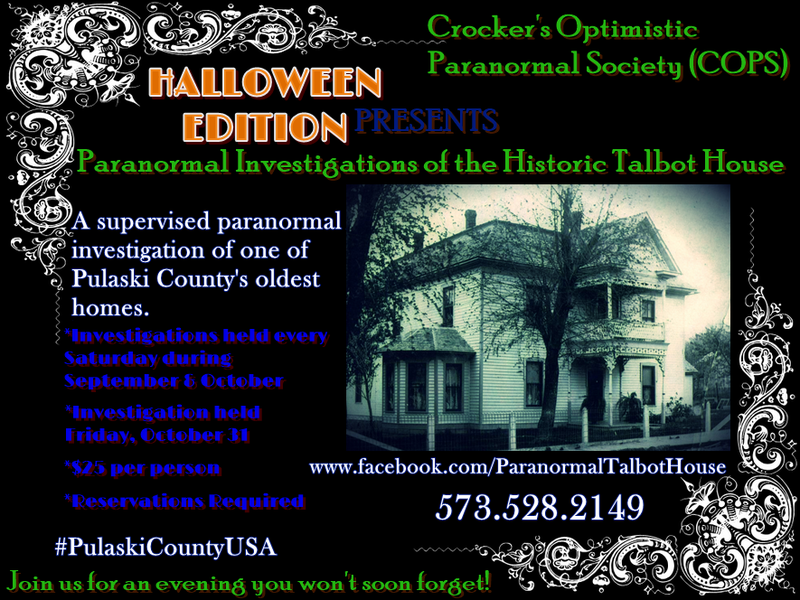 Paranormal Investigations of the Historic Talbot House- An evening you won’t soon forget! Spend the evening conducting your own paranormal investigation in one of Waynesville’s oldest homes. The house was built in 1885 by Reverend Albert Davis who died in his bedroom three years later after suffering from burns he received while heroically fighting a fire that consumed part of the towns business row south of the Square. In the 125+ year history of the home it has served as a hotel, a doctor’s office, a boarding house, an antiques store, and a landmark of Waynesville. Complete Listing of Autumn Activities in Pulaski County, MO. 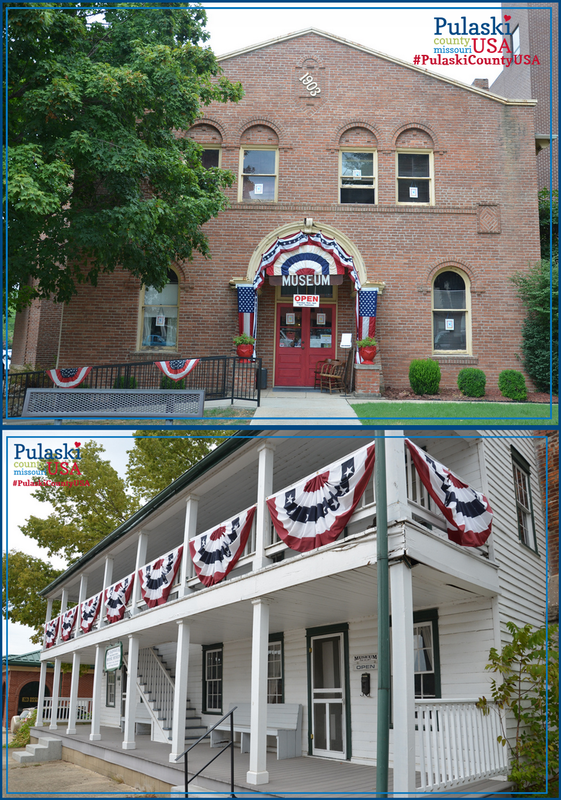 Lodging Information for Pulaski County, MO. ORLANDO FLORIDA- FIREBALL RUN, an online reality travel series announces the “Scary Cars” as seen in Transformers: Age of Extinction, Directed by Michael Bay will participate in Season 8 FIREBALL RUN America’s Frontier. The production films live beginning Sept 27th in Frisco, Texas, thereafter traveling to Camden, AR., Ardmore, OK., Enid, OK., Bentonville, AR., Pulaski County, MO., Sedalia, MO., and finishes October 4th in Independence, Missouri. Rally Fighter vehicles, manufactured by Arizona based Local Motors, have had an ongoing presence in the FIREBALL RUN series since 2012. However this season both vehicles used in the Transformers pivotal chase scenes are schedule to compete and make appearances in the 2014 FIREBALL RUN competition series. 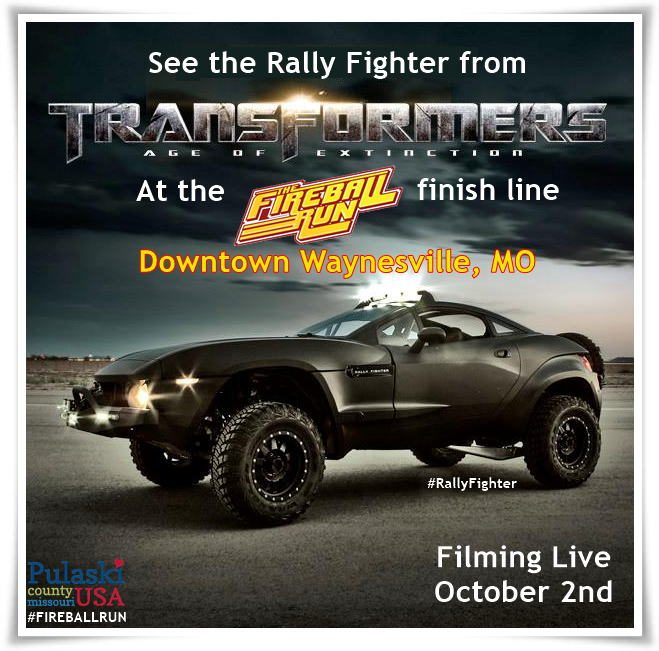 The public is encouraged to come out to the public event in Downtown Waynesville on October 2, from 3- 6 pm for the live filming of the FIREBALL RUN series, meet the drivers of all 40 participant vehicles, and then get up close with the Rally Fighter movie cars. 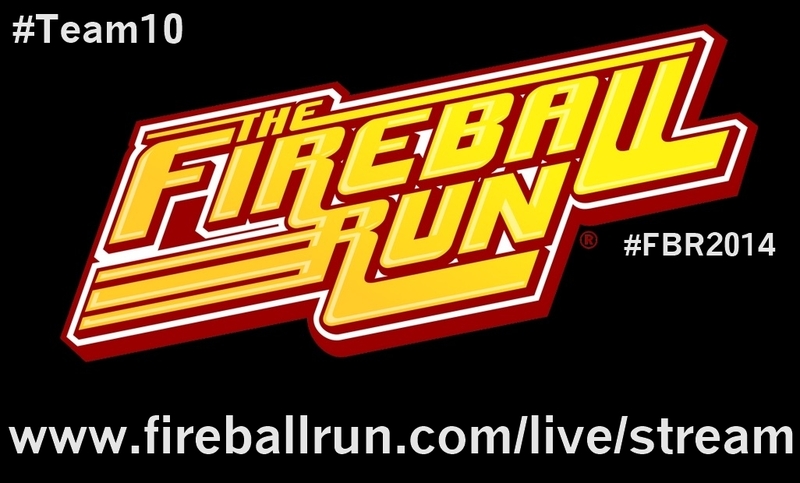 Unlike the typical reality TV series, the FIREBALL RUN is filmed in real time. The competition is somewhat similar to the 1980’s Cannonball Run movie starring Burt Reynolds and Dom DeLuise as a team of drivers in a wacky coast-to-coast race from New York to California. Unlike the movie however FIREBALL RUN teams are not road racing, instead teams from all over the world participate in a life-size, brain-challenging, trivia pursuit game called an adventurally (adventure-rally). Their vehicles serving as pawns on a massive game board the size of America. To advance from city to city and score they solve trivia based on a geographical position. After which they must complete a series of tasks ranging from zany to life-changing. And if you’re wondering what the prize is- don’t set your hopes too high. Teams compete for bragging rights and a plastic road sign, all while raising awareness for missing children. The FIREBALL RUN series is available on Roku, GoogleTV, Amazon FireTV, and Smart TV on the AdeysTV Channel. All seasons and episodes are also available on YouTube and iTunes.